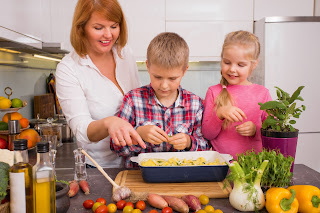 If you are like most of the Mums I know you want your children to eat good, healthy, home cooked food either all the time or at least most of the time. You know it's good for them, and cheaper too, so it just makes sense to avoid pre-packaged meals as much as you can. You have an image of yourself whipping up comforting shepherd's pies or pasta bakes after school, blitzing puree for the baby and effortlessly making sure everybody gets their 5 a day. Then reality hits! You have no energy after the school run, can only think of three recipes, burn the toast, manage to use every saucepan you own and the baby throws the puree at the cat. Some days things just don't go your way! Even if you love cooking and are great in the kitchen you could use some help, and if you aren't a great cook then you need this course even more! Are you ready to introduce your baby to solid foods? After many requests I have written my guide to weaning, making things simple and fun! Click on the picture to get your copy. "Weaning your baby is an exciting time, marking a move from the newborn days and a step towards toddlerhood. It's a time of exploration and discovery that should be fun for babies and parents. Unfortunately though, it can often be spoilt by worries. Is my baby eating enough? Or too much? What about choking? Allergies? Should they be feeding themselves? Maybe it's just safer to wait?? This book is the calm voice in the centre of the storm, written by a highly qualified and experienced Norland Nanny and trusted parenting advisor. Nanny Lorna will reassure you that there is no need to worry, show you how to introduce foods to your little one and have you sharing relaxed family meals in no time." 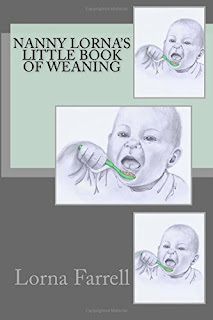 "This clearly written little book gives concise and easily read advice on weaning a baby on to solids. It's a real boon to any parent who wants a trustworthy source of information written by an experienced professional in all aspects of baby care." 5 Stars!